Notes: If you are in 640 X 480 (the default Gruntz Resolution), it exactly fits in full screen. Yes, it solvez in a short amount of (game timer) time. Yes, it is physically a small map. But yes, you will be challenged to solve this puzzle! Re the walkthrough, after hitting the secret switch, it says to get the coin and the warp letter, however, on the CL that I have there are two coins and no warp letter. What's up? Are you playing in "Easy" mode? 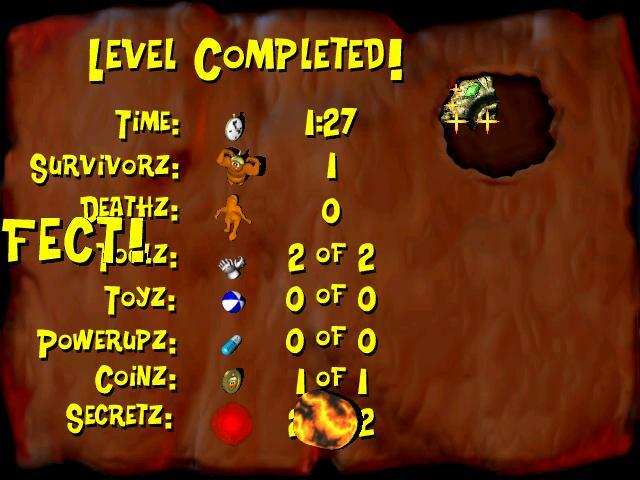 Several thingz are not available in many Custom Levelz in "Easy" mode that one can get in the normal play mode. Would someone who normally playz in the default (640X480) screen resolution mode please re-play this one, and do a screen grab showing the "PERFECT!" result, and send the "Statz.jpg" to me in an e-mail attachment? In order to re-play this small CL without losing my preferred screen resolution, I expanded it to 32X24 (plain water, nothing else). When I completed it, there was no "Perfect!" score ... no WARP letter. So I now have a version with a Warp letter 'W" instead of one of the two Coinz, and added a GlobalAmbientSound, a VoiceTrigger, and several BehindCandyAni Water effectz. If Gamer is agreeable, I will re-upload (or upload to my own web host, I should say) the version for which a "Perfect!" score is now possible, in the original map size. I had to delete Gamer's post in this thread, because my browser (Internet Explorer) was unable to access the thread (probably because of the attachment ... which I deleted after saving it to my hard drive). Perhaps the problem is that I deleted the attachment! Anyway, I will make Gamer's new version available with its own download link, so that anyone may try it out. 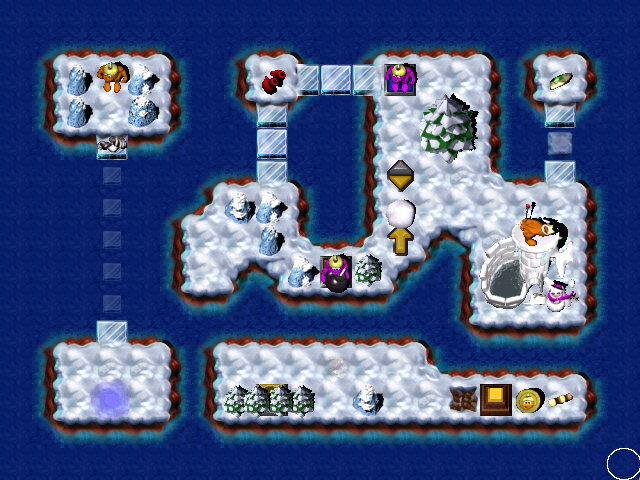 Ok, I just played this level again to have a break from designing and beta-testing. In the version I have(I downloaded it from Paul's site), there are 2 coinz to the right of the golden brick, and a W letter under the rock. If I get the glovez, I cannot get the W. If I keep gauntletz, then I can't go back and get glovez to finish the level. I know I'm very bad at finishing CLz with a PERFECT! and sometimez I'm a little stupid too, but how can I do it? I think the letter was supposed to be where one of the coinz is. At least that's what the walkthrough leads me to believe. Otherwise it is not possible to break the rock. I dont know how play in normal mode,can you help me? You have probably been playing in 'Normal' mode all along, since you routinely achieve a "PERFECT!" score. So the problem is probably that you have the original version of the CL ... without my modification. If you use the download link in the original post, you will probably see a difference, and be able to achieve a "PERFECT!" score. Sheroan, have you downloaded the correct version of thiz CL and got PERFECT score, playing Normal mode? I got it easily. Yes, SwordGrunt, it'z a good, easy CL (anyway you must think some to finish it ), ideal for a break. And alwayz a good idea. Anyway, you both can try to play thiz "good" version.